We are constantly reminded of the advantages to staying as chemical free as possible in life. We just don't know the far reaching effects these things have on our lives and our future. Doesn't it seem like every day you read another article backing up this point? Well in case you haven't had your daily dose, here's one for you. 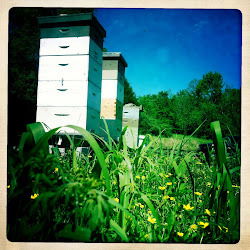 Get to know your beekeepers and ask questions. Do they use chemicals? How often? What kinds? Do they use antibiotics? Where are their bees foraging? We deserve to know what goes on behind the fence line!